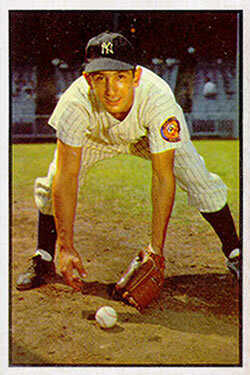 As a player on the great New York Yankees teams of the 1950s and later as a manager with five different major-league clubs, Billy Martin was known to be brash, bold, and fearless. He played the game hard and made no excuses for the way he handled himself on or off the field. Many people, including his off-and-on boss, George Steinbrenner, considered Martin a baseball genius for the intuitive way he managed his teams. Billy started out playing baseball on the sandlots around Berkeley, and while in high school joined up with the Oakland Junior Oaks, an amateur club sponsored by Oakland’s Pacific Coast League team. Showing his proclivity for a good fight, Martin was spending his free time boxing in the amateur ranks in the San Francisco/Oakland area. After graduating from high school in 1946, Martin signed with the Idaho Falls Russets of the Class D Pioneer League. He played 32 games at third base for the Russets, not hitting much but playing solid infield defense. Even with his lackluster batting, Oakland Oaks owner Brick Laws saw something in the youngster and purchased his contract from Idaho Falls. Martin struggled at the plate and in the field for the Oaks in 1947, causing manager Casey Stengel to farm him out to the Phoenix Senators of the Class C Arizona-Texas League. Once in Phoenix, he regained his confidence, hitting .392 in the hitter-happy league. In his next two seasons with Oakland, Martin, moved to the middle infield, played well defensively and began to hit more consistently. During his early tenure with the Oaks, Martin complained to manager Casey Stengel about hitting eighth in the batting order. Stengel, who enjoyed a father/son relationship with the brash youngster, told him that he was actually the second cleanup hitter. Martin grudgingly accepted Casey’s explanation and that night collected two hits and three RBIs. Martin, reunited with his former mentor Stengel,4 made his major-league debut on April 18, 1950, against the Boston Red Sox. He banged out two hits in the eighth inning of a 15-10 New York victory. A short time later, Martin, Duane Pillette, and future Hall of Fame first baseman Johnny Mize were sent down to the Kansas City Blues of the American Association on 24-hour recall. The move was made just before the May 17 deadline, which required major-league teams to trim their rosters to 25 players. A month later, Mize and Martin were recalled, Mize to fill in for injured first baseman Tommy Heinrich and Martin to replace second baseman Snuffy Stirnweiss, who had been traded to the St Louis Browns. Martin batted.250 in his first big-league season and, aside from 1955, never hit over .267. His forte was his consistent defense and his ability to come up with big hits in crucial situations. During the offseason, Martin and teammates Whitey Ford and Bob Brown were drafted into the military. Martin spent five months in the Army during the winter of 1950-51 before being discharged in the spring for hardship reasons (his financial responsibilities to his wife, sister, mother, and stepfather). Because of his military service, the Yankees had to keep him on the roster for a year, though he didn’t count against the 25-man limit. Martin made one appearance as a pinch-runner in the 1951 World Series. The Yankees defeated the New York Giants in six games, Martin’s first of four world championship teams as a player. After the 1951 season, Martin and a group of major and minor leaguers traveled to Japan for a series of exhibition games. The Americans, managed by Lefty O’Doul, played 15 games against top players in Japan, winning 13. Near the end of the tour, Martin, Dom DiMaggio, Mel Parnell, Ferris Fain, and George Strickland flew to Korea and spent two days visiting the front lines. The following March, Martin broke two bones in his right ankle demonstrating his sliding technique for a Joe DiMaggio television show. The injury caused him to miss the first few weeks of the 1952 campaign. The Yankees won the pennant in 1952 and faced their crosstown rival Brooklyn Dodgers in the World Series. The Yankees came out on top, and Martin’s spectacular catch of a wind-blown popup by Jackie Robinson in the seventh inning of Game Seven with two outs and the bases loaded helped seal the win. Martin and Courtney got into another scuffle during the 1953 season, and that same year he exchanged blows with Detroit Tigers catcher Matt Batts. Because of his growing reputation as a fighter, players on opposing teams were coming in hard at second base, trying to injure the 160-pound second baseman on nearly every close play around the bag. Stengel commented, “Billy’s being hit with the hardest blocks this side of a professional football field.”5 Martin simply said, “They can slide as hard as they like, as long as they slide clean. When they don’t slide clean they’ll hear it from me. Otherwise, they’ll get no complaints.” Rough slides aside, Martin finished with the second highest fielding percentage of all American League second basemen. The two teams split Games Four and Five and the stage was set for Martin’s heroics in Game Six. In the bottom of the ninth inning, he smacked a base hit off Clem Labine, plating Hank Bauer with the game-winning run. It was the Yankees’ fifth consecutive world championship. Martin’s 23 total bases in the six-game series eclipsed the old record of 19 set by Babe Ruth 30 years earlier. Billy collected 12 hits, including two home runs, two triples, and a double. His 12 hits also tied the mark for a seven-game Series. His .500 batting average, five extra-base hits and two triples tied the record for a six-game Series. He received the Babe Ruth Memorial Award, given to the best player in the Series. Shortly after the birth of his daughter, Kelly Ann, in January 1954, Martin was reclassified 1-A by the Berkeley, California, draft board. He appealed the decision, claiming that he supported his estranged wife, Lois (whom he had married in 1950), his daughter, his sister, his mother, and his stepfather to support. Losing his appeal, he was drafted into the Army. After basic training, Martin was sent to Fort Carson, Colorado, where he eventually rose to the rank of corporal in the 61st Infantry Regiment and managed the post baseball team to a 15-2 record. He also played on the base basketball team. Given a furlough, Martin rejoined the Yankees and worked his way back into the lineup, hitting .300 in 20 games. The Yankees edged out Cleveland for the pennant and once again drew the Brooklyn Dodgers in the Series. The Army extended Martin’s furlough, which allowed him to play in the World Series. New York lost in seven games, but Martin performed well, finishing with a .320 batting average. Although he missed most of the season, the Yankees voted Martin a full $5,598 share of the losers’ World Series bonus. Finally discharged from the Army, Martin discovered that his reputation as a brawler and carouser was not ingratiating him with Yankee management and, most importantly, general manager George Weiss. After a much-publicized brawl at the Copacabana nightclub in New York, Martin was traded to the Kansas City A’s in a seven-player deal. Martin initially accepted the deal as standard baseball business, but later stopped talking to Stengel over what he perceived to be his manager’s not fighting hard enough to keep him on the team. He played the rest of the 1957 season with the A’s and on November 20 was traded with five other players to the Detroit Tigers for five major leaguers and a minor leaguer. Martin was livid over the trade, telling the Associated Press, “They just can’t throw us [players] around from one club to another without us having a say-so.” His complaint fell on deaf ears; after the season he was traded to Cleveland, the third time the scrappy infielder had been traded in 17 months. And in December 1959 he was on the move again, this time traded to the Cincinnati Reds. On August 6, 1960, Martin was suspended for five days and fined $500 by National League President Warren Giles for punching Chicago Cubs pitcher Jim Brewer in the face. The incident occurred after Brewer had thrown a pitch behind Martin, the ball caroming off the fiery second baseman’s bat and hitting him in the head. On the next pitch, he swung and missed, letting the bat fly in the direction of the pitcher’s mound. While Martin walked out to retrieve the Louisville Slugger, Brewer picked it up and took a few steps toward the Reds infielder. Feigning to reach for the bat, Billy unleashed a right-handed haymaker that landed squarely on Brewer’s face, fracturing the orbital bone around the pitcher’s eye. The Montreal Gazette of August 6, 1960, printed Martin’s description of the incident, “Brewer threw at my head and nobody is going to do that. I was in the hospital last year when I got hit in the face and had seven fractures. Nobody is going to throw at my head again. That first pitch by Brewer was behind my head and Cub pitchers knocked me down three times on Wednesday.” Both benches cleared during the incident, and Martin was ejected from the game. In December 1960 the Reds sold Martin to the Milwaukee Braves. He failed to win the second-base job from incumbent Frank Bolling, and in June of 1961 was traded to the Minnesota Twins for shortstop Billy Consolo. The Twins acquired Martin to take the place of Billy Gardner, who was at the end of his career. In the spring of 1962, Martin lost the second-base job to rookie Bernie Allen and was released by the Twins. Although the Kansas City A’s had expressed an interest, Billy decided it was time to retire as an active player and pursue other interests on and off the field. A fair hitter who always seemed to come through in the clutch, Martin finished his career with a .257 batting average. He made the All-Star team in 1956. Steady with the glove, he usually showed above-average range. In his five World Series (28 games), Martin collected 33 hits, two doubles, three triples, five home runs, and 19 RBIs while posting a .333 batting average. After he retired, the Twins hired Martin as a special scout. He also took a public-relations job with a local brewery. By 1965 he was back on the field, as the Twins’ third-base coach. In June 1968 he was named manager of Minnesota’s Triple-A affiliate in Denver. Martin succeeded Cal Ermer as manager of the Twins in 1969. In his first year the team went 97-65 and finished in first place in the newly formed American League West division. The Twins’ opponent in the first best-of-five American League playoffs was the Baltimore Orioles. Baltimore swept the Twins in three games, and Martin was criticized in the press for some of his decisions during the series. For example, he started pitcher Bob Miller in the third game; Miller was knocked out of the box in the second inning. When Twins owner Calvin Griffith asked him why he started a pitcher who had a 5-5 record during the regular season, Martin told him, “Because I’m the manager, that’s why.” The rash comment led to Martin’s firing a few days later. Martin had been on shaky ground with the Minnesota front office all season for numerous reasons, including criticizing the Twins farm system in the press and for getting into a well-publicized fight with pitcher Dave Boswell, a 20-game winner, outside a Detroit bar in early August. After being fired, Martin took a year off from baseball and went to work for radio station KDWB in Minneapolis. The following October, the Detroit Tigers hired him as their manager. In his first year with the club, Martin guided Detroit to 91 wins and a second-place finish in the American League East. In 1972 Martin’s Tigers edged out the Boston Red Sox by a half-game for the American League East pennant but lost to Oakland in the playoffs. The series was marred by a heated brawl in the seventh inning of Game Two. The donnybrook started when A’s shortstop Bert Campaneris threw a bat at Tigers pitcher Lerrin LaGrow after being hit by a pitch. Martin was incensed and had to be restrained from going after Campaneris. While the team was conducting spring training in 1973, Martin and Tigers rookie prospect Ike Blessitt were arrested outside a Lakeland, Florida, restaurant. Blessitt had a disagreement with a patron in the establishment; Martin, acting as peacemaker, took the young player outside to calm him down. The police arrived and, according to Martin, directed racist remarks toward Blessitt, who was African American. When the Tigers manager objected to the police comments, both men were arrested and charged with using profanity in a public place. A few days later, Martin quit as manager of the Tigers over a disagreement with general manager Jim Campbell about a fine that Martin had levied on outfielder Willie Horton. Campbell increased the fine on Horton, making Martin so mad he resigned from the team. Reconsidering his rash decision, he returned the next day. On September 2, 1973, the Tigers fired Martin, with one year left on a reported $65,000 annual contract. Martin was finishing up a three-day suspension for ordering his pitchers to throw spitballs when he learned of his release in a phone call from Jim Campbell. The spitball incident occurred in a game against Cleveland Indians. Martin felt that Indians pitcher Gaylord Perry was doctoring the ball and in an effort to show him up ordered Tigers pitchers Jim Coleman and Fred Scherman to use saliva and Vaseline on their pitches. Martin blatantly told reporters after the game about his tactics, leading to his suspension from American League President Joe Cronin. Asked by a reporter from United Press International about his firing, Martin replied, “They did what they thought was right and I did what I thought was right.” Martin had been cautioned by Campbell not to make disparaging comments in the newspapers about Commissioner Bowie Kuhn, Joe Cronin, and various Tigers front-office personnel. Martin repeatedly disregarded the warnings, and the spitball incident was the final straw. The Rangers had lost 100 games or more in the previous two seasons, but under Martin they won 84 games and finished in second place in 1974, his first full year with the team. Texas signed a number of high-priced free agents The next year the team struggled during the first half of the season, and on July 20, 1975, the new owner, Brad Corbett, fired Martin. The 1977 campaign was tumultuous for the Yankees as Martin feuded with owner Steinbrenner and newly acquired superstar Reggie Jackson. Martin, in the first year of a $100,000 contract, was rumored to be on the chopping block for most of the season. Despite the turmoil, the Yankees won the American League East and again defeated the Kansas City Royals in the ALCS. The Bronx Bombers went on to defeat the Los Angeles Dodgers in six games in Martin’s only World Series championship as a manager. In 1978 Martin made disparaging comments about Steinbrenner and Jackson: “One is a born liar and the other convicted.” Not surprisingly, he was forced to resign on July 24. But he was rehired in 1979 and then fired at the end of the year after the Yankees failed to reach the playoffs for the first time since 1975. 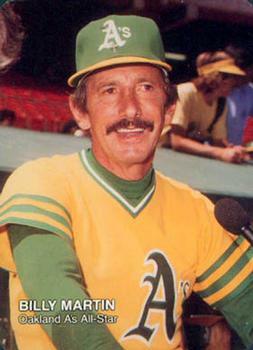 In 1980 Martin was hired to manage the Oakland A’s by the team’s eccentric owner, Charlie Finley. Martin instilled his aggressive style of inside baseball, eventually known as Billyball, with great success. The 1981 season was divided into two parts because of the players strike. The A’s won the first half of the schedule and went on to sweep Kansas City in the initial round of the playoffs. But they were swept by the Yankees in the American League Championship Series. Oakland played poorly under Martin in 1982 and, amid criticism of his handling of the A’s pitching staff, he was let go on October 20, 1982. Steinbrenner brought Martin back as Yankees manager in 1983 and on July 24 he became embroiled in one of the most controversial plays in modern baseball history. The incident occurred after Kansas City Royals third baseman George Brett clouted a two-run homer off Goose Gossage with two outs in the top of the ninth inning at Yankee Stadium that gave the Royals a one-run lead. Martin had been aware for a while that Brett used more pine tar on his bat than was allowed by league rules. Billy decided that this would be a good time to bring it to the attention of the umpires. They agreed with Martin, and the home run was disallowed, constituting the last out of the game. Kansas City protested the game, and American League President Lee MacPhail ruled in favor of the Royals. The game was scheduled to be resumed on August 18, 1983. The Yankees informed the public that they would have to pay full admission to see the rest of the game, which led to a lawsuit by group of fans. Eventually the Yankees relented, allowing fans who had stubs from the July 24 game to get in the ballpark free while charging bargain prices for those who wished to buy tickets. Only 1,200 people showed up to watch Hal McRae strike out to end the top of the ninth and the Yankees fail to score in the bottom half of the inning. The game officially ended with the Royals leading 5-4. Martin was cut loose once again by Steinbrenner on December 16, 1983, and replaced by Yogi Berra. Martin went on to have two more managerial stints with the Yankees. In 1985 he took over for Berra 16 games into the season. The team went 91-54 under Martin and finished in second place. He was fired on October 27, 1985, and replaced by Lou Piniella. On October 19, 1987, he came back for the fifth time, succeeding Piniella. Martin lasted 68 games into the 1988 season before being ousted once again by Steinbrenner. During his tenure as a major-league manager, Martin’s off-field exploits were legendary; he got into fights with team officials, bar patrons, a cab driver, a marshmallow salesman, various fans, and two of his pitchers. After leaving the Yankees in 1988, he remained on the team’s payroll as a special consultant. A short time later, rumors began to circulate that Billy would return to manage the Yankees in 1990. In the early evening hours of December 25, 1989, Martin’s pickup truck skidded off an icy road near his country home in Fenton, New York, and plummeted 300 feet down an embankment, flipping over and landing on its right side. The 61-year-old Martin was killed in the accident, and his good friend from his days in Detroit, Bill Reedy, was seriously injured. The two had been drinking at a local bar, and Martin allowed Reedy to drive his truck home that evening. At Martin’s viewing in a New York City funeral home, thousands filed in to pay their last respects. The funeral took place at St. Patrick’s Cathedral, and Cardinal John O’Connor delivered the eulogy. More than 500 attended, including former President Richard Nixon, numerous baseball executives, and many players and ex-players. Billy Martin was survived by his fourth wife, the former Jill Guiver; children Kelly Ann and Billy Joe; and one grandchild.10 The self-proclaimed proudest Yankee was laid to rest at Gate of Heaven Cemetery in Hawthorne, New York, a stone’s throw from the grave of Babe Ruth. An updated version of this biography appeared in "A Pennant for the Twin Cities: The 1965 Minnesota Twins" (SABR, 2015), edited by Gregory H. Wolf. 1 “Billy Martin” in David Pietrusza, Matthew Silverman, and Michael Gershman, eds., Baseball: The Biographical Encyclopedia, 715. 2 William Kates (Associated Press), “Billy Martin dies in crash on icy road,” Madison (Indiana) Courier, December 26, 1989, 6. 3 The deal was completed on July 5, 1950, when the Yankees sent catcher Eddie Malone to Oakland. 4 Stengel took over as the manager of the Yankees in 1949. 5 Miami News, August 3, 1953. 6 We were never able to locate information pertaining to any action Secretary of the Army Stevens may have taken in the Martin case. The situation may have settled itself as Martin was sent to Fort Carson and made no further complaints about his treatment. 7 Miami News, October 13, 1969. 8 Richard Sandomir, “Life According to Herzog” New York Times, July 25, 2012. 9 Milwaukee Sentinel, October 17, 1977. 10 Martin and Lois Berndt were married in 1950; she left him in 1954 and was the mother of Kelly Ann. Sources vary, but Martin and Gretchen Winkler were married in 1959 or 1961, and divorced in 1979; she was the mother of Billy Joe. Martin married Heather Ervolino in 1982; they divorced in 1984. He and Jillian Guiver married on January 25, 1989.